Frankfurt - With only a couple of minutes left on the clock, swept Patrick Reichelt's low cross from the right into the back of the net, wrapping up a 3-1 victory for the home side. The archetypically German names notwithstanding, the venue for this particular encounter on October 15 was the Panaad Stadium in Bacolod City, where the aforementioned hosts, the Philippines, had just got the better of Pakistan to retain the 2013 edition of the Philippine Football Peace Cup. Reichelt currently plays for top Thai side Singhtarua FC, the Berlin-born midfielder having ended up in Bangkok by way of Energie Cottbus reserves, among others. Schröck, however, is an altogether more familiar name to regular followers of the German professional game. After helping SpVgg Greuther Fürth up to the Bundesliga for the first time and then spending a season with TSG 1899 Hoffenheim, the 27-year-old all-rounder is now on the books at Eintracht Frankfurt, a couple of hours west of his home town of Schweinfurt. A mere hop, skip and a jump compared to the mileage he puts in to represent his chosen country these days. Not that pulling on a shirt for the populous western Pacific multi-island state, currently 137th in the FIFA world rankings, was in any way pre-ordained. The son of a German father and Filipina mother, Schröck swapped local outfit DJK Schweinfurt for Greuther Fürth as a teenager and, playing in one of the best junior club set-ups in the country at the time, went on to turn out with no little success for Germany's U-19s as well, helping them to the semi-finals of the 2005 European Championships in Northern Ireland. His progress at club level was steady rather than spectacular. U-19 coach Reiner Geyer “had to do a lot of preaching. I guess it paid off in the end,” Schröck recalled later with a smile. It took another three years or so to establish himself as a first-team regular in a Fürth side consistently in the promotion mix in Bundesliga 2 and equally consistently coming up just short. At the start of the 2010/11 campaign, head coach Mike Büskens switched the now 24-year-old from midfield to right back and the move proved a resounding success, until a knee injury and subsequent operation kept him on the sidelines for virtually the whole second season-half. The following year, Fürth's 'unpromotables' finally made it into the top flight and as Bundesliga 2 champions for good measure. Schröck was a mainstay at the back for them, starting 29 league games and chipping in with three goals of his own. Eintracht Frankfurt, incidentally, were the second team to earn promotion behind the Franconians and the two clubs would go on to experience radically contrasting fortunes in the higher division. Schröck meanwhile took his leave of Fürth after eight years, snapped up for Hoffenheim by then-head coach Markus Babbel. It would prove a tumultuous campaign for the south-western club and their new signing got an early taste of things to come at the start of September 2012, earning a red card for a second bookable offence a quarter of an hour from the end of a 4-0 home whipping at the hands of his future employers Frankfurt. Come the following May, 1899 had retained their place in the Bundesliga by the skin of their teeth, Fürth had dropped straight back down to the second flight and Frankfurt had capped off a superb season by earning a place in the UEFA Europa League. Eintracht moved swiftly to strengthen their squad for the enhanced schedule ahead and Schröck found himself packing his bags again, this time for Germany's financial capital on the River Main. Eagles’ head coach Armin Veh was well pleased with the acquisition of a player “we were already interested in last year, because he can be deployed in a number of positions". However, the competition is fierce in Frankfurt's beefed-up ranks and thus far Schröck has been restricted to just a couple of Bundesliga starts in his accustomed right-back berth - against Bayern München and Borussia Dortmund, no less. 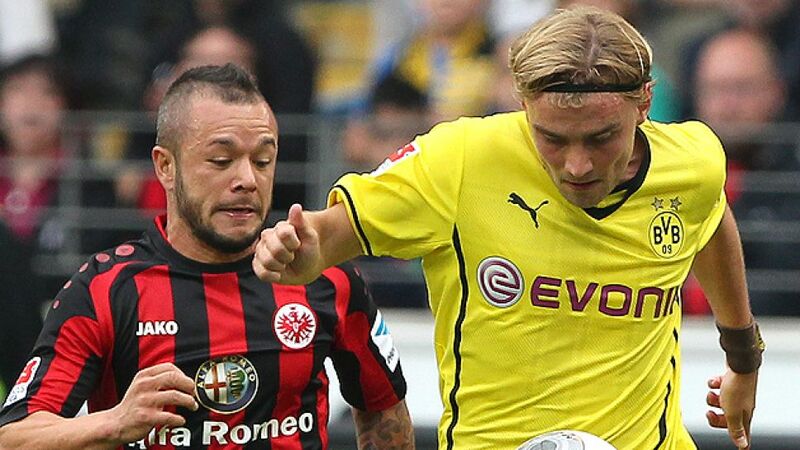 He acquitted himself well in both outings, with Eintracht losing out by a single goal to each of the 2013 UEFA Champions League finalists, but subsequently had to make way again for first-choice full back Sebastian Jung. Schröck will undoubtedly be given an extended opportunity to show what he can do at the top level, however, with Veh naturally mindful of his new signing's abilities in the middle of the park as well. At any rate, this particular son of Schweinfurt seems assured of a pivotal role for some time to come on the road less travelled with the Philippines. The Azkals' retention of the Peace Cup, against Pakistan and Chinese Taipei - both even further than down the world rankings - may be fairly small fry on the global stage, but with Schröck's help they are certainly moving in the right direction.